There are many ways which we can use to secure the electrical wiring between a development board, basic electronic components and various modules, sensors to prevent loose connection, short circuit or wrong interpretation. Securing jumper wire connections is an important part of breadboard wiring. 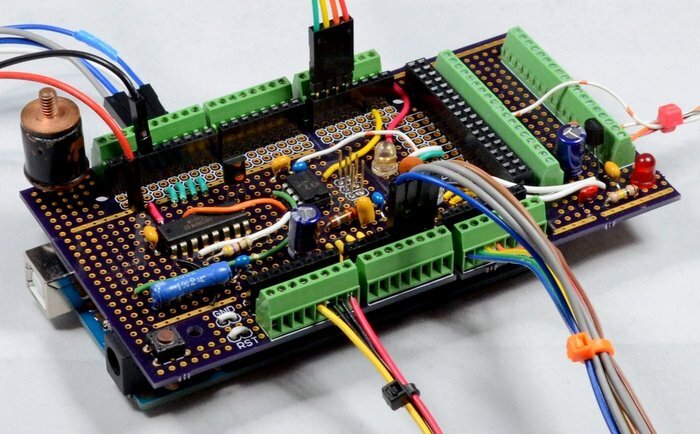 Prototyping daugterboard (prototyping shield) can help you securing the connections. In previous guide, we talked about jumper wire & solid wire for breadboard wiring. In this scenario, whether jumper wire is enough or you need solid wire to secure with screw mount that depends on many matters. Prototyping daugterboard also known as prototyping shield. There are many types of ready to use prototyping daugterboards available on the market mainly targeted for commonly used development boards like Arduino or single board computers like Raspberry Pi. The header connectors are not designed for using jumper wires. We use them simply because that is the cheap and easy way. With an ordinary prototyping daughterboard you can solder wires and components on the shield and later you can remove the daughterboard to re-use the development board like Arduino for another project without needing to remove any solder. Ordinary prototyping daugterboards aka prototyping shields are cheaper but has no screw terminal block. Prototyping daugterboards (prototyping shields) with screw terminal block costs higher. There are prototyping daugterboard kits available. However they also cost higher and suitable for limited number of projects. Screw terminal blocks are also not designed for jumper wires. Screw terminal blocks are intended to secure wires. If we need to mount a component like TM1637 LED display, we may need to use standoffs to make it mechanically more stable. Performing a Google image search with the phrase like DIY prototyping daugterboard will deliver better idea for your project than we can illustrate. I always suggest to use a wooden board as base for practical reasons. Cite this article as: Abhishek Ghosh, "Securing Jumper Wire Connections : Prototyping Daugterboard," in The Customize Windows, June 28, 2017, April 25, 2019, https://thecustomizewindows.com/2017/06/securing-jumper-wire-connections-prototyping-daugterboard/.